When moving a boat through water with non-wind-based propulsion, it is necessary to accelerate some portion of the water (or air, in the case of aircraft) in the opposite direction that the boat is traveling, what is called the "thrust fluid." This is generally done with a paddle (or paddle wheel) or a propeller. To increase efficiency, the goal is to subject more thrust fluid to less acceleration (accelerating more thrust fluid less is more efficient than accelerating less thrust fluid more), for a given amount of thrust. Fins have potential to subject more thrust water to less acceleration. Paddles are a wonderful technology. Very old, very simple. A wide range of boat hulls can go with a wide range of paddles. Paddles can be transported separately from the hull. They really are a fantastic technology. Paddles, however, are not as efficient as propellers. For at least half (if not more) of the paddle cycle, the paddle is not in the water. Paddles led to paddle wheels, which led to propellers. Propellers are generally more efficient than paddles. However, propeller-craft design involves known compromises. For example, the engine should be in a straight line relative to the propeller to reduce drive-train resistance which occurs whenever the drive-train deviates from a straight line. Also, the propeller should be as large as possible. However, this involves increasing the displacement of the hull to accommodate the engine and propeller or it involves canting the propeller and engine at an angle off horizontal, either of which reduce efficiency. Propellers also have a peak efficiency at a fairly narrow range of speeds. Travel slower or faster than this speed, and the efficiency of the propeller drops off rapidly. The efficiency/speed graph for a propeller looks more-or-less like a downward facing parabola, with peak efficiency in the narrow range of speeds at the top of the parabola. In addition, propellers rotate the column of thrust fluid. Rotation of the column is necessary, but does not produce thrust and is a drain on efficiency. Rotation can be eliminated by dual propellers, but that doubles the frontal area of the drive components and increases skin friction. Fins (foils, hydrofoils, wings, etc.) have the potential to be more efficient than propellers. The efficiency graph for a fin starts higher than such a graph for a typical propeller and is flatter than the graph for a propeller -- fins do not loose or gain efficiency as much as propellers at different speeds. 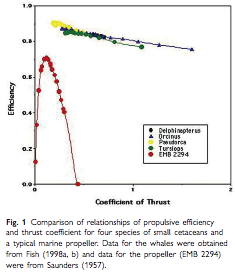 This graph is from "Hydrodynamic Flow Control in Marine Mammals," Frank E. Fish, Laurens E. Howle, and Mark M. Murray, presented in the symposium ‘‘Going with the Flow: Ecomorphological Variation across Aquatic Flow Regimes,’’ presented at the annual meeting of the Society for Integrative and Comparative Biology, January 2–6, 2008, at San Antonio, Texas. Here is an excellent thesis on fish-like swimming by Steve Kamadulski. Here is an interesting video on vortices in water. Here is a great video of a whale swimming. However, how do you connect the motor to the fin? Many "conventional" fin-powered watercraft designs involve compromises similar to those encountered when designing a propeller-driven craft. There are long drive shafts, parts bear asymmetric loads, a lot of moving parts, in general. Also, a single fin is going to result in "bobbing" of the craft (up-down or side-to-side). This can be eliminated by using more than one fin, but then the craft has more than one fin, more than one set of frontal-areas for the fins, more than one set of drive-train mechanisms, etc., all of which are going to reduce efficiency. The design of the fishBOAT accepts that a fin-based craft is going to "bob" and seeks to optimize (not eliminate) the oscillatory relationship between engine and fins. Yes! The human-scale prototype demonstrates that the engine and fins can be efficiently connected through basically one moving part -- the entire boat. High-frequency cancelling oscillations proved not to be a problem and matching the craft-wave and the oscillation of the engine was found to be intuitive for a human rider. This lead to development of the torque reaction engine. Here is a link to the early human-scale prototype. The early prototype became the fishBOOT, which showed me how to make the fishBOAT. Hobie Cat has developed an interesting fin-drive for use on kayaks which they call the "MirageDrive." Another interesting fin-craft is the trampofoil. MIT developed a "RobotTuna". It swims like a fish, though has hundreds of parts, is fragile, expensive, and complex to make. It an only be deployed for a few hours at a time and would never be found towing a barge. Notwithstanding all of these problems, the US Navy is still developing the design, (now called the Ghostswimmer) because it can operate quietly and it is maneuverable. Here is a video by Boston Engineering regarding the Ghostswimmer. The fishBOAT has only one significant part, is durable, inexpensive, efficient, easy to make AND it is quiet and maneuverable.